Melt the butter in the microwave and place a griddle over a high flame. Using a pastry brush, coat each side of the panettone with butter. Place on the hot griddle and cook for 2 minutes on each side. Meanwhile, put the mascarpone, sugar and brandy together in a small bowl and beat until smooth. 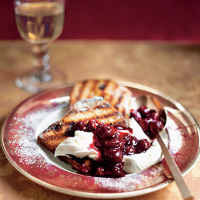 Take the panettone off the griddle and place 2 slices on each of two plates, dust with more icing sugar and spoon over the mascarpone and cherry compote (or dried fruit if using). A super-sweet dessert wine with some acidity is needed here. This recipe was first published in December 2006.